Hi, I am SAMBHU DEBNATH travelled to Bhopal, Kanha, Jabalpur. It was really an amazing trip. It wouldn't have been possile without the support from LT VACATION travel agency and HELLO TRAVEL team. According to me Madhya Pradesh is such a state where the inner peace in people is more important than the modernization of the society. The state is not much developed by technology but it is a peaceful state at all. Travellers will feel peace of mind after returning from there. The state is surrounded by forests, rivers, lakes and caves. There are a lot of water falls and temples. We met Mr. L. Tiwary, prop-LT Vacation,one reknowned travel agent of Rewa through Hello Travel who helped us a lot to travel for a five night six day trip to Bhopal-Panchmari-Kanha-Jabalpur providing star hotel and luxury car and ofcourse rendering his excellent service through out entire journey. Firstly Raja Bhoj Airport in Bhopal is itself a beautiful place within calm and quite nature surrounded by hillocks outside city. Bhopal is a city of Lake and monuments. 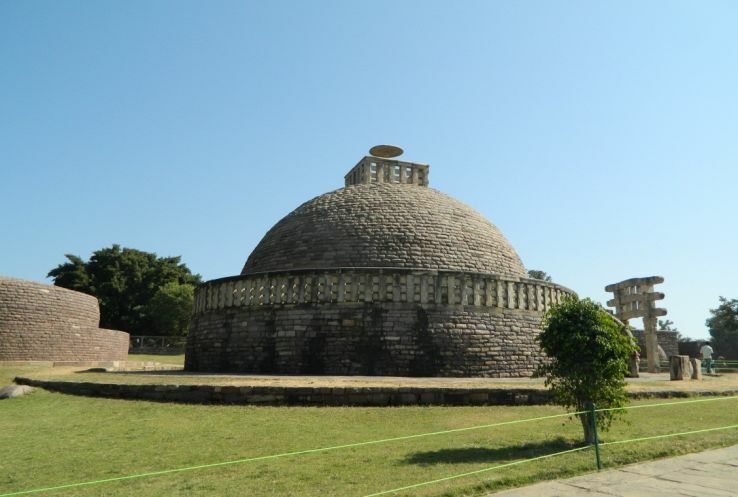 Nearby historical place is Sanchi Stupa. It is a huge semi-circular, dome shaped chamber in which the relics of Lord Buddha are kept in serene calmness. It is a brick construction that dates back to the third century A.D.Still it is as new a newly made construction. On the way to Panchmari Bhim Betka caves wondered us due to its sign of pre historic present of mankind with their cultural evidence, related paintings of around 2000 years ago.One temple in such a remote place made us spellbound and emotional. Panchmari is a small,planned and beautiful hillstation within nature as it is. Largest army training centre. Jatashankar temple in a cave,Panch Pandav Cave, spiral road leads to view pointDhupgarh and a boating lake are the main attractions of tourist interest. There are several MPTDC bunglows with a touch of British culture adds extra luxurious feelings for this place. Then from Panchmari to kanha is a long but pleasant journey through villages and small towns.On this way some roadside garden-fresh fruit sellers will make you bound to give a hault to have a taste of fruits.This way leads to Kanha in the evening. Kanha jungle camp is just aside jungle with it’s earthy smell and an exotic ambience of nature. The next early morning the jungle safari was an amazing experience for all of us, seeing peacocks, varities of birds, spotted deer, pigs, elephants and lastly the Tiger.It was walking through the middle of the road like a king made us spellbound. The other highlight of the Kanha National Forest Reserve is the spectacular sunset and sunrise point. After lunch we proceed for Jabalpur. Next morning we visited Marbel rock, really Marvelous. River Normoda is flowing through deep Canion and then to famous Dhuadhar falls, as if our Niagra must give you an ethnic pleasure of mind. Madhya Pradesh promises a wonderful shopping experience. In fact as you travel to Madhya Pradesh, you can't return without doing a little bit shopping .Madhya Pradesh is the attraction for it’s traditional handicrafts,it is renowned for its textile products. The tradition seems to be alive in exquisite Chanderi and Maheshwari sarees. All over the state is full of natural beauty and peaceful environment that will worth you the journey absolutely.